Co:Writer Universal uses grammar- and vocabulary-smart word prediction to help students better express their ideas in writing across devices. And now built-in speech recognition adds an entirely new way of getting ideas out! Only Co:Writer Universal gives students access to the most powerful word prediction on their favorite devices (Chromebooks, iPads, and Mac/Windows desktops), over 4 million topic dictionaries, built-in speech recognition in Google Chrome, and incredible privacy-safe data collection. Want to test out Co:Writer Universal before you decide to buy? Sign up for a free trial. 22P40WSEAT3Y - price is the total for the 3 year access to Co:Writer Universal for a single user. Looking to purchase a district or site license? Contact Bridges for bigger discounts and a detailed proposal. Word Prediction: Be a fearless writer with grammar-smart, inventive spelling aware word prediction. Speech-to-Text: Don't want to type? Speak it and we'll write it. Topic Dictionaries: Need particular vocabulary? We have over 5 million topic dictionaries. Momentary Dictionaries: Reading and writing? Momentary dictionaries automatically pull in the vocabulary from what you're reading so you can write. Text-to-Speech: Auditory feedback while you write and revise. Anywhere, anytime access: It doesn't matter if a student is working in a library, at home, at a friend's place, or the classroom. Whether on an iPad, laptop, Chromebook or virtually any tool that can run a Google Chrome browser, Co:Writer is there. Not just for a BYOD (Bring Your Own Device) environment, the flexibility of Co:Writer Universal removes usage barriers. Shared Settings: Students' personal Co:Writer Universal settings follow them through the cloud on any platform they choose. Writing Integration: Students can write in Co:Writer’s built-in word processor for iPad or Chrome, and their writing is now shared through the cloud! Speech Recognition: The Chrome extension now has integrated speech recognition (speech to text). Universal Licensing: new subscription pricing means universal access for everyone in your education environment -- students, teachers, consultants -- on any platform they need. Reporting: Detailed reporting and qualitative usage statistics will be available across all platforms. Co:Writer Universal | Quick Demo from DonJohnstonInc on Vimeo. In the past, transferring files between school, home, and across computers was challenging at best, and sometimes impossible. Co:Writer Universal eliminates this obstacle entirely. Students simply write in Co:Writer’s built-in word processor for iPad or Chrome, and the writing is shared through the cloud! Set background and text preferences and create a Topic Dictionary in any platform and they automatically sync in any other platform or device. In less than a year, Co:Writer for iOS has made the list of top 100 most popular education apps. Co:Writer for iOS includes many of the key supports you rely on to help your most struggling writers, such as FlexSpell™ and Topic Dictionaries, which carry over when using Co:Writer on other devices. And now writings are saved to the cloud so they are accessible across iPads, desktop, and Chromebooks. 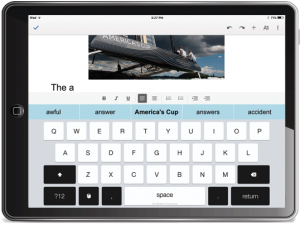 Co:Writer Universal includes a keyboard for your iPads (iTouch and iPhones too)! Use it anywhere you write like email, websites, and Google Drive. It works just like Apple’s stock keyboard, but the prediction is much better and it supports Topic Dictionaries and data collection. The data fully integrates with Educator Dashboard. See it for yourself in this quick, 2-minute video. CoWriter Universal Keyboard for iPad from DonJohnstonInc on Vimeo. Customize Co:Writer to meet your specific needs. Change the look and feel, speech settings, and voices. Your updated settings will automatically sync across platforms through the cloud. Co:Writer Universal Extension for Chrome integrates with the Chrome browser for word prediction and speech recognition just about anywhere students write online, including Google Drive, blogs, social networks and email. Co:Writer instantly scrapes email contents and webpages for unique vocabulary that can be automatically included into Co:Writer’s Topic Dictionaries. Co:Writer Universal seamlessly integrates through the Chrome browser on Mac, Windows, and Chromebooks. Both an app and extension are available for nearly any writing task and include Co:Writer’s unmatchable Flexspell™ technology and grammar-based recognition. Settings allow you to customize Co:Writer to meet your specific needs. Change the look and feel, number of guesses, speech settings, and voices. Any changes to your settings will automatically sync across platforms through the cloud. Take your writings and share them to Google Drive, Dropbox, Facebook, or copy and paste them in other applications and word processors. You can even print them out to hand in the traditional way. Get Co:Writer support on just about any website. Whether updating your blog, writing an email, or writing a report in Google Drive, you’ll have access to Co:Writer’s grammar-smart word prediction and topic dictionaries. If students can write just 30% of what they want to say, Co:Writer will do the rest. As students write, Co:Writer "predicts” what they’re trying to say and offers word suggestions in real time. Even the most egregious spelling and grammar mistakes aren’t a problem for Co:Writer’s proprietary FlexSpell™ technology. Co:Writer goes further, bringing in topic-specific vocabulary instantly when writing in the content areas. You have to try it with a student to believe the impact it has! Read "Word Prediction—What’s Good Enough?” http://donjohnston.com/word-prediction-whats-good-enough/#.VA8ROcJdXbM to learn the difference between Co:Writer and other word prediction programs. Co:Writer offers extensive options for most accessibility needs for display, prediction, and speech. Need to speak it? No problem. Just click on the microphone choice -- you speak, Co:writer writes it. Great for starting an idea or narrowing a choice you don’t see. Seamlessly use speech supports when you need it, but be able to go to typing and selecting when that works better. See Co:Writer’s built-in speech recognition for yourself in this 2-min demo. Using Speech Recognition in Co:Writer Universal from DonJohnstonInc on Vimeo. Predict in the topic you’re writing about to improve accuracy and build specialized vocabulary. Over 4 million topic dictionaries are at your fingertips covering all curriculum subjects. Just type the first few letters of the topic name and choose the topic. The topic-specific words are automatically added to Co:Writer predictions. Momentary Topic Dictionaries automatically scrape email contents and webpages for unique vocabulary and bring them into Co:Writer’s dictionaries. So if you’re replying to an email, you may be surprised to see the sender’s name and words from their email automatically appear in your guesses! Co:Writer Universal adds speech capabilities to your device. Simply select a passage of text and right click. Co:Writer can speak the text aloud. It can also add words in the selection to your personal word dictionary or create a new Topic Dictionary from the passage. The word bank helps break writer’s block. It automatically presents a list of topic-specific words whenever a Topic Dictionary is selected, and is available in both list and word cloud view. It’s hard to make good decisions without good data. Fortunately, Co:Writer Universal gives you access to the kind of data you need to make great decisions. It shows you how much students are writing with Co:Writer as well as their vocabulary acquisition and usage. This data gives you a level of fidelity of implementation that you’ve never had before! See Co:Writer Data in this 3-minute video. Co:Writer Universal | Understanding the Data from DonJohnstonInc on Vimeo. How much are your AT tools being used? You’ll know exactly how much students are writing with Co:Writer, down to the word and hour! For monthly subscription options starting at 4.99 USD available on Don Johnston's page. Follow the link here. *Note: if your school has restrictions on out-of-country purchases, or other considerations, please contact Bridges to facilitate your subscription purchase.